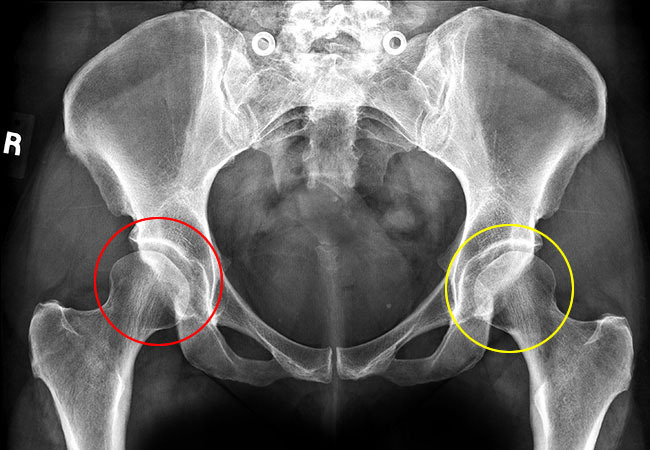 Adult hip dysplasia occurs in adults when the femoral head or the acetabulum has not developed fully or correctly. It becomes difficult for the femoral head to remain properly positioned within the acetabulum if the hip has a poorly angled or rotated femoral head/neck or shallow acetabulum. A severe or prolonged misalignment of the hip’s ball and socket results in increased friction which causes the joint’s cartilage to wear out quickly leading to cartilage (labral) tears and eventually osteoarthritis. An example of adult bilateral hip dysplasia, right worse than the left. Shallow acetabuli fail to provide adequate coverage of the femoral heads. Adult hip dysplasia ranges from mild to severe and can affect one or both hips. A dysplastic hip socket typically causes discomfort and pain beginning in late adolescence and gradually becomes worse over time. A shallow acetabulum may develop during infancy but may not be evident until after puberty and may not cause pain until the teen years or later. A limp if one hip joint is affected or waddle if both hip joints are affected. However, an abnormal gait might be more difficult to detect if both hips are dislocated. While adult hip dysplasia occurs in adults as a result of abnormal development of the hip during the growing years, the exact cause of this development is unknown. Given that early detection is a vital factor in treatment in infants, screenings for hip dysplasia should take place during all postnatal exams and continue throughout infancy. Detection remains equally important during adolescence and adulthood which necessitates immediate evaluation of and care for any persistent hip pain. Following the onset of hip pain or discomfort in an adult or adolescent, a physical exam should be performed to assess the hip’s range of motion. In a case of adult hip dysplasia that is mild or in the early stages, the hip may have a mostly normal range of motion. However, discomfort or stiffness in the hip may occur when attempts are made to move the leg away from the body (abduction) or from a bent 90 degree to a straight extended position. As the condition worsens, the patient may develop a limp, leg lengths may appear unequal, and it may become difficult to rotate the thigh towards or away from the body. X-rays and MRI scans should be ordered to clarify and confirm the results of the physical exams. X-rays are typically used to assess the alignment of the acetabulum and femoral head while MRI scans are used to assess the hip’s soft tissue and cartilage (labrum). ULtrasonography, CT Scans, and Arthrogram may also be ordered as part of the radiographic examination.